Curling has a long and distinguished history in Parry Sound. The Parry Sound Curling Club was founded in 1898 and no community could have been prouder than when the 1959 Parry Sound High School Curling Team created Provincial and National media attention through their successes on the Rink. This story starts at the beginning of the school year in September 1958. Parry Sound High School teacher, Haddon Meldrum had been coaching curling for a few years and would have been looking to build his team for the upcoming competitive season. While Haddon passed away in 1998, those around are quick to commend his passion for the sport. Building a team required both great curling skills and that the curlers have an acceptable scholastic level as well. Irvin Wallace was selected as Skip. Irv brought several years of experience to the rink and was from a family of curlers. Irvin grew up on Lake Rosseau and had just transferred in to Parry Sound for Grade 13. Doug Mortson, a Parry Sound boy also in Grade 13 and an all-around athlete who had been curling for about three years, was selected as Vice Skip. 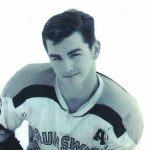 Ken Gilchrist, also a Grade 13 Parry Sound boy, was dedicated as Second Position and gave up most of his other activities to focus on his efforts on the rink. 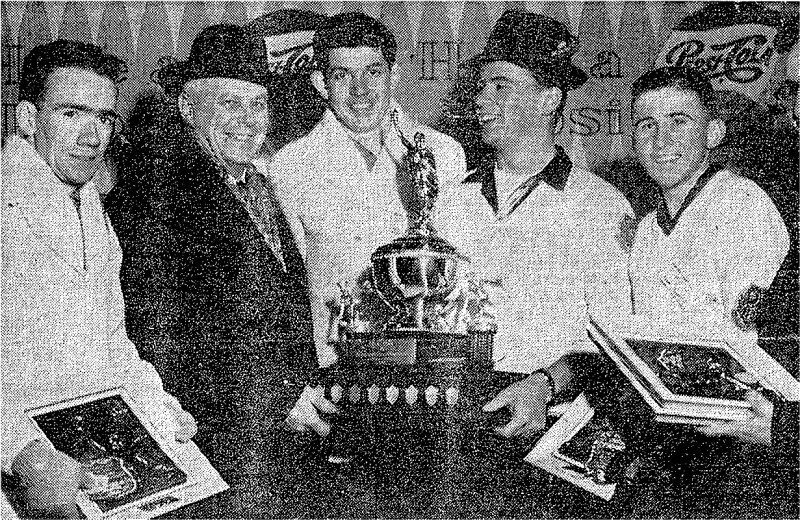 And the youngest, Bob Holmes, at 15 years old and his first year in high school and only his second year in the sport of curling, sparked something in Coach Meldrum who recognized that Holmes brought what was needed to round out the team and fill the Lead Position. The boys and Coach Meldrum practiced with passion and commitment. This was going to be their year. Taking on much more senior teams for practice which included very successful local curlers like Gord Tudhope, they prepared for the Provincial Curling Championship. 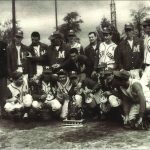 The Provincial Playdowns were held in Welland, Ontario, where Skip Wallace and his team Mortson, Gilchrist and Holmes took on team after team to advance to the final nail-biting match against the defending championship Welland Team to win the coveted Pepsi Cola Trophy. It was a tough battle for the Parry Sound team as they fought from behind against a very strong Lindsay Team and then proceeded to down Welland in a hard fought final struggle that was undecided until the final rock. 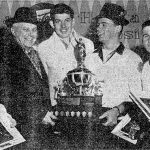 On January 19, 1959, the boys made Parry Sound the home of the Southern Ontario Schoolboy Provincial Championship, qualifying for the National Bonspiel in Calgary, Alberta. Returning to Parry Sound, the entire community rallied around our successful school boys to prepare them for the Nationals in Calgary. While the team focused on preparing to play, the town set about ensuring they were prepared in every other way. Parry Sound Town Council purchased car coats for the team; the School Board donated blue blazers; the Lion’s Club presented pigskin gloves; Rotary provided curling club pins for them to share with the other teams. The list went on, to result in the Best Dressed Team. This was the first trip west for any of the boys and the opportunity to fly First Class was a treat that they perhaps only now realize was very special and unique! Arriving in Calgary, the social schedule was extensive. Participants were hosted with tours and trips to showcase the area. Every attendee was presented with a white Stetson hat from the Mayor of Calgary, but they were there for one reason…to Curl. This was a National Tournament with 44 of the Dominion’s High School curlers, the best competitively and among the best scholastically across Canada representing their Provinces with two teams from Ontario. Parry Sound played team after team with impressive results that quickly reflected that they were top contenders. They defeated the favoured Manitoba team which positioned them in a deadlock for the lead with Alberta moving into the final games of the competition. One of the most exciting games of the tournament saw the two Ontario teams go head-to-head. The experience of team Northern Ontario, Fort Francis’ skip Tom Tod lead his team to victory over our Parry Sound boys. The final result was in doubt until the final rocks of the tournament, but Alberta secured the National Championship and the Parry Sound team finished in a very proud second. The team returned home to great celebrations in the community. The leadership of Coach Meldrum to take these four young gentleman and build a Championship team speaks to the caliber of all of them. With three of the boys in Grade 13, this was the only year the boys would curl together. 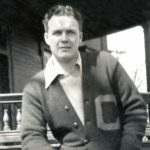 Coach Haddon Meldrum continued to teach school and coach curling until his retirement in 1976. Bob Holmes the youngest on the team continued to curl during high school and still lives in Parry Sound today. Ken Gilchrist finished Parry Sound High school and enjoyed a career with the Ministry of Transportation Surveyor Teams. Doug Mortson graduated from Laurentian University and went on to enjoy a career of over 30 years in teaching. Skip Irvin Wallace went on to attend both Queen’s and Laurentian Universities. Irvin continued with the family business, Wallace Marina on Lake Rosseau until he retired. He now lives in Orillia. All were surprised to hear of the nomination. Some have not connected in many years, but the memories of the success of the 1959 Parry Sound High School Curling Team have once again brought them together to be recognized as they are inducted into the Bobby Orr Hall of Fame.